Powder coating – kovo VESUV s.r.o. Before the metal works are coated with powder paint they are ungreased in a degreasing box, and then dried in the oven at the 120°C hanging on special carriages. 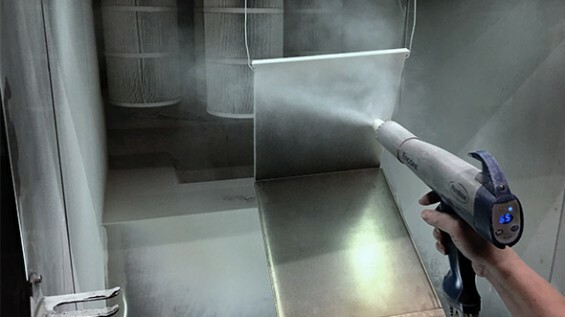 In the box, where all types of plastic powder are applied with a use of electrostatic or electro-kinetic technique, we paint products with a required final colour shade and harden them in the oven according to a customer´s demand. We use a variety of RAL and PANTONE, smooth or textured paints, matte, semi-gloss and gloss.